I needed chapstick. That’s why I stopped at Meijer (our local supermarket) first thing in the morning. I pulled into a space relatively close to the door so I could get in and out and go about my day. There was a cart in the space next to mine. I noticed a brown paper bag on the bottom. The way down bottom. Where you’d put your mega-sized package of toilet paper or mac and cheese. Inside the bag were about a dozen paperback books. Interesting, I thought. Who would do that? So, I hopped out of my van and snapped a few pictures. A woman in an SUV looked up from her texting and looked at me like I was a crazy woman. I thought about telling her that I’m a writer and that makes my crazy lady badge justifiable. But she had gone back to her texting. The closer I got to the books, the more my curiosity flared. What was the story of these books? Where did they come from? Why did someone just dump them? Then I got a little melancholy about them. No. I know. Books are paper and glue and don’t have what kids these days call the “feels” (that’s whippersnapper talk for “emotions”). But I became sad because I see the culture of paper books declining in exchange for ebooks. Now, I don’t think ebooks are bad. Not at all. They have people reading. They’re compact. They’re accessible. And they aren’t for me. I’ve tried. I’ve got a Nook. I have the Kindle app on my laptop and phone and iPod and tablet (why in the WORLD do I have all those devices?). I simply do not enjoy reading from an electronic thing-a-ma-jobber. I prefer paper. It has a texture which is pleasing. The weight of a book anchors me, reminding me that it’s time to read (not time to check Facebook or Amazon stats or Twitter). I am also a book sniffer. Yes, I admit it. They smell good. But the best part of paper books? They can be passed down. This summer I read the 14 Oz books to my kids. As much as I could, I gave the different characters their own voices and mannerisms. We giggled through certain parts and felt the tension build in others. I held the book up so they could examine the pictures. 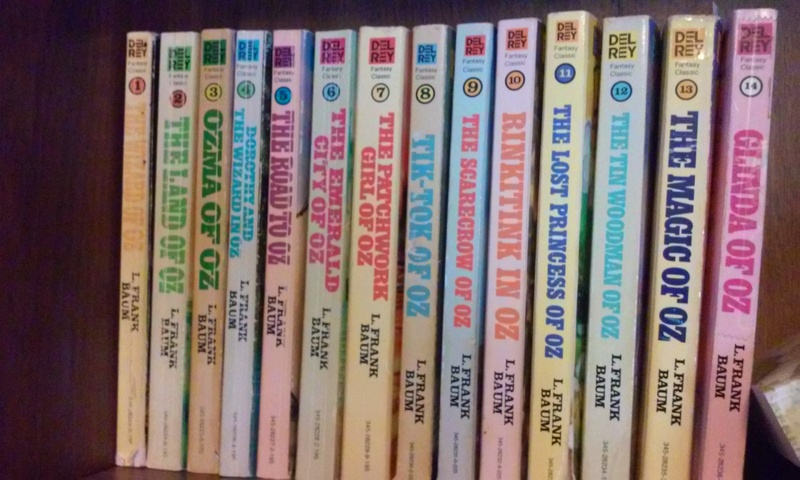 My kids often played “Oz” in the backyard. I read from the collection we had in my home when I was a kid. These were the books my mom held as she read to us, giving the characters their own voices and mannerisms. This is the last of the collection. Glinda of Oz. I remember writing our last name in it. 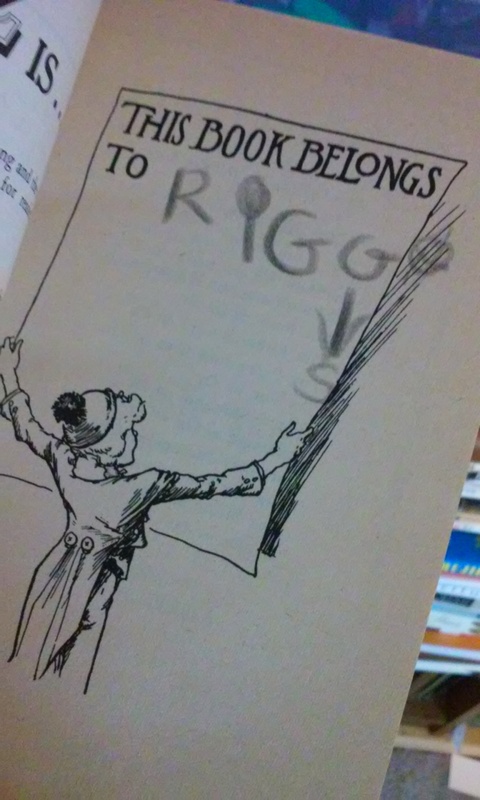 Riggs (note: the ‘s’ is below a little). My boys make their ‘i’s the same way I did. These books held memories. No. Not just that. They are part of my family heritage. Something that links me and my kids to who we are and where we’ve been. You just don’t get this kind of experience with a glossy screen and fancy finger-swiping page turning (not that there’s anything wrong with that). This is just another reason why I won’t abandon the paperback. Susie, we’re too much alike! I’ve gone through a variety of electronic devices also, and nothing, absolutely nothing in the world, not even movies, will ever replace a “book!” I’m talking about what you’re talking about, real paper and glue books. In my world nothing can take their place. Now, about that bag of books. That would have been me checking out that bag of forgotten books. 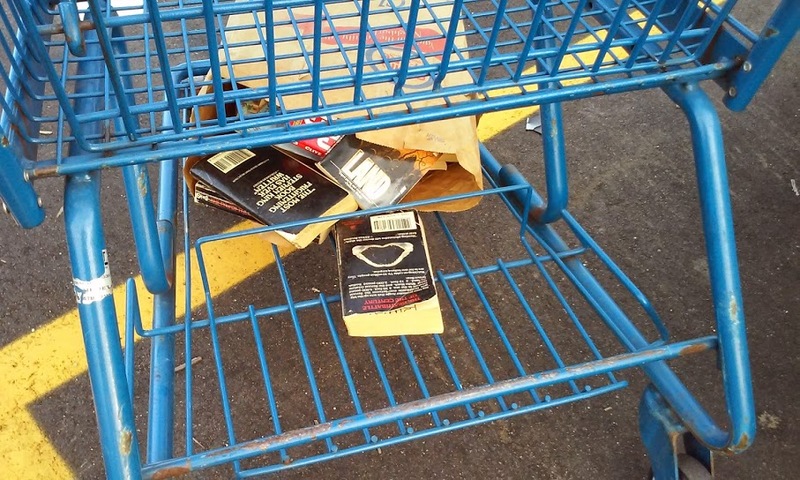 Did someone forget to drop them in the donations book box in the parking lot? Were they too lazy to walk them over to the box? They obviously cleaned those books out of their house for a reason. Did they absentmindly leave them on the cart, forgetting about them. Did they find the bag of books lying next to the book box and grabbed them to save them from the elements because they couldn’t fit into the collection box, someone else’s leftovers? 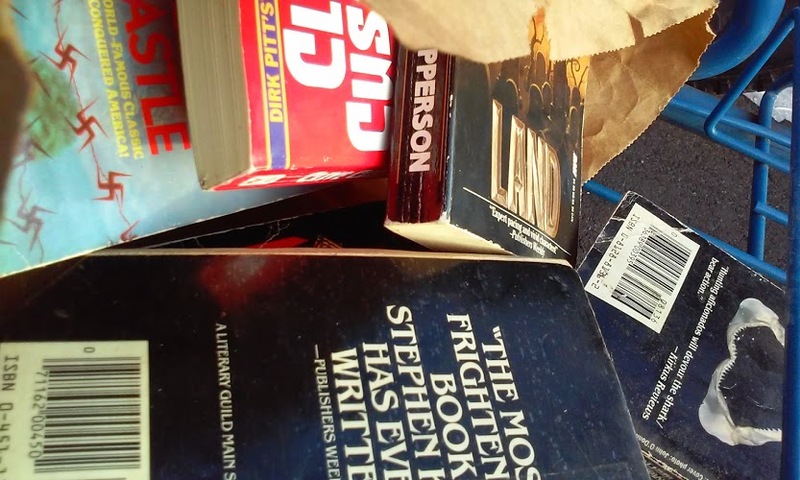 I’ll be thinking about this bag of books for days, making up stories in my mind about that forgotten or neglected back of books that someone might have enjoyed reading. It’s the old lady in me. Never mind my rambling. Just get a bit melancholy when thinking about those poor books…..
Preach it, sister! Nothing better than holding a beautiful yellowed book in your hand. Also, there’s nothing better than smelling old books. It’s like reader-crack, I tell you! I left them there. I was a little afraid of what was in the bottom of the bag and/or if there were bugs or something within the pages. Ack! I have loved to read books since before I could read. I have certain books that I kept and have read them to the girls. I too love the smell of a “real” book and miss reading books like that. That being said, I love the ease of getting new books with my Kindle. I have gotten a lot of free ones that I loved and ended up buying more of that author. I may have never found that author otherwise. When I got my first Kindle 4 or 5 years ago it was because there were days I would struggle to hold a book because of tendonitis in my hands so I just wouldn’t read. I am thankful for my Kindle for that reason. I have passed on my love of reading to my girls and am thankful that they are eager to dive in. I’m really glad that ebooks have been a success for you, Shelana! And I (as an author) am grateful that you are such a big reader! I know you’re impacting your girls to be readers for life. Isn’t it fun? Wow, they could have put them in one of those fancy new “share a book, take a book” boxes that are popping up around. They wouldn’t even have to take one. There’s one right on the Boardwalk in Grand Haven! I think that is such a cool idea! At our Marina, we have a give and take library. And I love the smell of books too! One of the things I miss the most about teaching elementary school, was ordering tons of new books, and reading them to the kids! I tried to instill the excitement and love of reading into them! On another note…I LOVE the way you use such fun words and use such great humor in your writing….”thing-a-ma-jobber”, and “whippersnapper!” You make me smile Susie! One more note…LOL….I am so excited that you will be at my Word Weavers small group in September. One familiar face you will see there for sure! I’m happy to learn how to improve my blog!